This somewhat macabre looking digital art piece had an interesting creation story, sometimes as an artist you have an image or visual concept in mind that you want to sketch out or create. 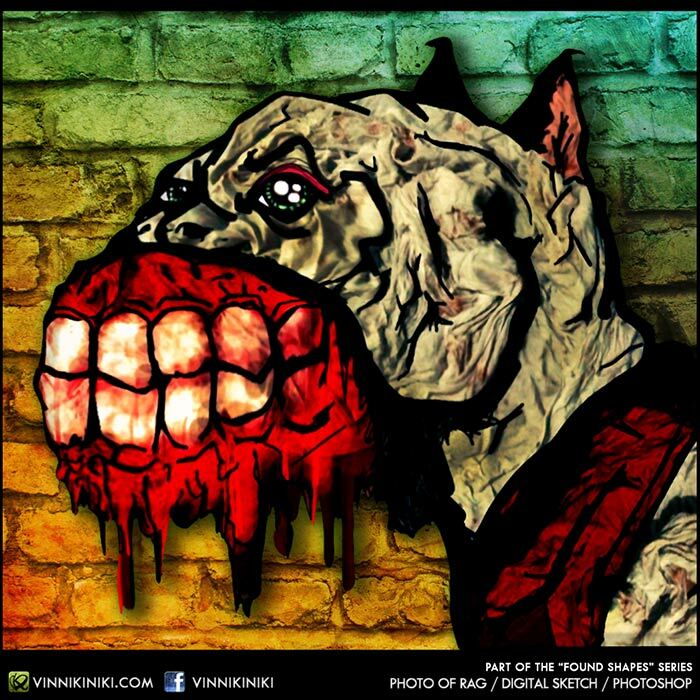 Other times inspiration comes from the most interesting and random of places, such is the case with this evil zombie looking dog with bleeding gums. I often see shapes, faces and forms in random places, for example cracks in the pavement, mountain and cliff faces, left-over food, or as was in this case; a dirty rag on my bathroom floor. It only took a split second, I walked into my bathroom for reasons unremembered and I saw the dog in the crusty soaked and mangled rag straight away. It’s as if I fill in the photoshop part and assemble the image in my head. I know where the dog’s eye will be drawn, the outline of the head and I kind of mentally visualise and apply a sketch outline in my mind’s eye while looking at dirty rags (that look like evil snarling dogs). I took a photo of the rag using my camera and then imported it into my iPad and using a neat app called brushes I drew on top of the original photo using a stylus. The great thing about this app is the ability to have many layers while you are working, however the app is only really good for drawing / digital painting, it’s quite crude when it comes to final finish and treatment. So once I got the image to a level I was happy with on the ipad I exported it into photoshop and did some further editing. I added the background in photoshop treating the drawing of the dog as a separate layer and also played with the tones and colours of the illustration of the dog. I’ve don’t this a few times before. I’m currently in the process of creating enough of these pieces to have a series ready for an art exhibition. It’s not quite ‘found art’ by definition but that’s the only name I can come up with the project at the moment. This picture is very scary but also eye catching and provocative. Amazing stuff.